Eight manufacturers will be represented on the starting grid of the Mazda Raceway California 8 Hours, the third round of the 2017 Intercontinental GT Challenge that commenced at the 2017 Liqui-Moly Bathurst 12 Hour. Among them will be two Acura NSX GT3, the car making its debut in the series at the Laguna Seca track. Two weeks before the start of the third round of the Intercontinental GT Challenge, the entry list for the inaugural Mazda Raceway California 8 Hours is finalised. No fewer than eight manufacturers are represented in the first-ever American round of the only global GT3 and GT4 championship. 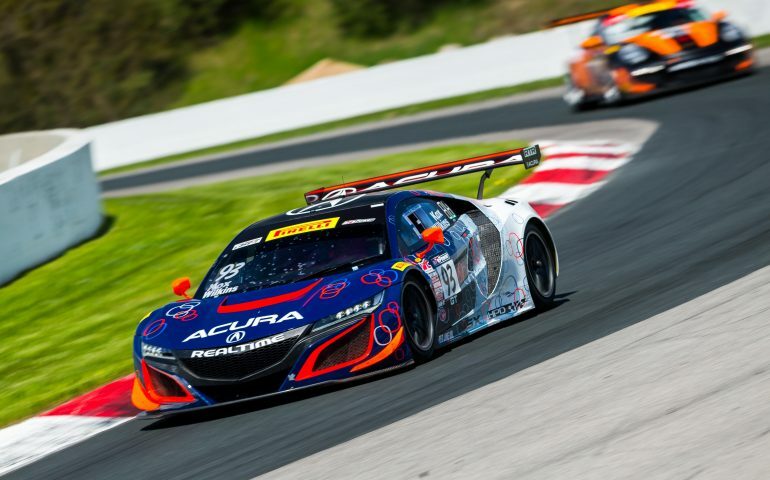 Among the cars entered are two of the long-awaited Acura NSX GT3 cars, entered by RealTime Racing. One of their drivers is French youngster Jules Gounon, winner of the Total 24 Hours of Spa and second in the Intercontinental GT Challenge drivers’ standings. Gounon’s fellow Spa victors Markus Winkelhock and Christopher Haase remain in the Audi camp, although they no longer share the same car. Winkelhock is one of the drivers of the Audi Sport Team Magnus, while Haase will be sharing the Audi R8 LMS of Audi Sport Team Land. Audi, leading the Intercontinental GT Challenge manufacturer standings, have two more representatives with Belgian Audi Club Team WRT and M1GT Racing. Other manufacturers with a GT3 entrant include McLaren (represented by K-PAX Racing), Nissan (RJN Motorsport) and Porsche (Black Swan Racing, Calvert Dynamics, GMG and Wright Motorsport). Audi currently lead the ICGT Challenge standings after two rounds, nine points ahead of Bentley. Porsche sit a further five points back in third place. Ferrari, who won the Liqui-Moly Bathurst 12 Hour thanks to a stunning performance by Maranello Motorsport this February, sit fourth however did not score points at the most recent round of the series. With the Total 24 Hours of Spa not counting towards the GT4 title, the Mazda Raceway California 8 Hours is the second round of the 2017 Intercontinental GT Challenge for GT4 manufacturers. Porsche (represented by GMG and Rearden Racing) and Ginetta (Ian Lacy Racing) will try to repeat their excellent season-opening results of the Liqui-Moly Bathurst 12 Hour, but they will have fierce competition from Aston Martin squads Automatic Racing and TRG. MARC Cars Australia has two MARC Mazda 3 V8 cars competing in the invitational class, adding more colour to an already varied starting grid of the Mazda Raceway California 8 Hours. “The California 8 Hours at Mazda Raceway Laguna Seca is an essential element of the Intercontinental GT Challenge, of which the success is likely to grow next season with the Suzuka 10 hours joining the already iconic Liqui-Moly Bathurst 12 Hour and Total 24 Hours of Spa events,” said Stephane Ratel, Founder & CEO SRO Motorsports Group. Greg Gill, President & CEO Pirelli World Challenge Championships, said: “We are very pleased to see the growth in the inaugural Intercontinental GT Challenge California 8 Hours race at Mazda Raceway Laguna Seca. Click here to view the current Laguna Seca entry list.